IN THE BEGINNING - Bere'sit - how elusive a word is Beginning! Are the opening words of the Bible referring to the Creation of the Universe, revealed to Man by divine edict; or do they refer to a new Beginning after Man was already established on this Earth? We believe the latter. The first two chapters of the Book of Genesis were fundamental to the later development of the Jewish and Christian religions. The text on which modern translations of this chapter are based, are taken from fragments of the Priestly Code (P) compiled during the Exile in Babylonia in the sixth century B.C. The text of the second chapter has been taken from the older Judaic Document (J), the various strata of which are believed to have originated in the Southern kingdom after 850 B.C. The first chapter, therefore, which is our main concern here, was written under the influence of redactors desperate to see the re-establishment of the Jewish state in its homeland.The con-quest by Nebuchadnezzar, and the exile in Babylonia, had been orchestrated by Yahweh (so they believed) in revenge for the abandonment of the Covenant by the Israelites. That this concept was foremost in the minds of the redactors, in compiling the books of the Old Testament, seems unequivocal; though whether it blinded them to the possibilities of alternative meanings to the ancient words which they were studying, cannot be determined. But, certainly, the interpretations put on these words led to a tradition that was to influence the Greek, and other European scholars, who were to produce our version of the Old Testament. Whether they were Mosaic in origin, or even earlier, the original writings have been lost in the mists of antiquity. All that is left to nourish two of the World's great religions are fragmented passages that have been copied and re-copied, meticulously, for nearly three thousand years. In that time, we believe the texts have remained remarkably constant except for the inevitable scribal error that must have crept in from time to time. But what have not remained constant are the Hebraic and Aramaic languages. 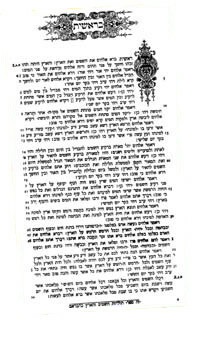 If we remind ourselves of how our own language has changed since Elizabethan times, a mere four hundred years ago, and how it is changing decade by decade in this modern expressively-permissive society, we can understand the dangers of taking a fragment of Hebraic text ø written perhaps in 1300 B.C., and edited and copied in 550 B.C. ø and of expecting that the individual words and phrases were all intended to carry the same connotations as they did, for example, in the time of the early Christian Fathers, sixteen hundred years later. Again, if to this uncertainty we add the dangers inherent in the Middle Eastern practice of paronomasia, by which one symbol or word, purposefully, may represent a number of different meanings, we are faced with an extremely difficult situation. Furthermore, we have drawn attention in our earlier books to the absolute necessity of fully understanding the context of an isolated passage in a Middle Eastern language before undertaking its translation. In many cases, a translator with a religious conception of the context has produced an entirely different translation from that of a translator with a secular conception. It will be argued that changes in a language with time are less important if there is a traditional understanding of the context and meaning of a passage Ø but this is only true as far back as the original misinterpretation of the context Ø if there were one. However, in making such translations, there is one golden rule. If the context could be open to doubt, and there are one or two alternative possibilities, then one or two alternative possibilities must be attempted. The correct one will nearly always become obvious because of its consistency; this being the yardstick by which such translations have to be judged. The Old Testament was translated into modern Hebrew - and then into Greek, forming the early chapters of Genesis. But this translation led to interpretations which were neither consistent within themselves, nor consistent with either the earlier Sumerian, or Hebraic Enochian accounts of the same events. These inconsistencies have been glossed over and ignored. It follows that, at this point, it is the authors' task to attempt an alternative translation of the first chapter of The Book of Genesis in an effort to determine whether a more consistent account can be obtained in a secular interpretation. In making this translation, very early texts were taken from The Book of Genesis: Critical Edition of the Hebrew Text by Canon C.J.Ball, and used in conjunction with the Jerusalem Bible in English, and A Concise Hebrew and Aramaic Lexicon of the Old Testament by William L. Holladay. We have had some concern over a suitable format for the presentation because considerable explanatory material has to be included if it is to carry any credibility. This material needs to be presented in a full Appendix as any bald statement of the alternative text would be meaningless to those for whom the traditional versions have a special value. This explanatory material is laid out on the following pages, verse by verse.